student has a bicycle that is mechanically safe to ride. History has shown us that we will be working on about 100 bikes. The event will be held on Wednesday, April 11 and Thursday April 12 from 4:00 to 8:30. The Hallsburg School will provide something for us to eat and drink. Please let the WBC know if you can help out on either of the two nights and if so, what time frame you will be able to work by filling out the form below. You can also e-mail your information to Rusty at rustyhans3@gmail.com. You don’t have to be an expert bicycle mechanic to help. 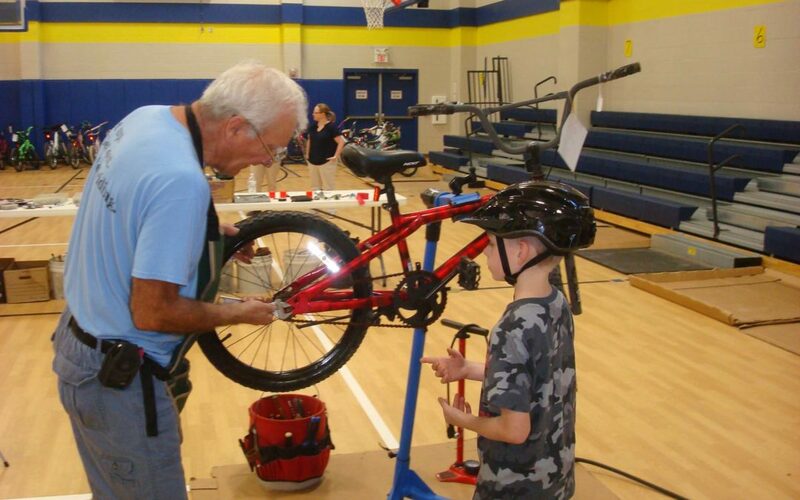 We need help airing up tires, replacing flat tubes, and checking helmet fit on the students. In general, we will be checking the bikes for proper reflectors, tightness of all hardware, brake functionality, shifting functionality, bike fit, and lubrication. If you have them, bring a repair stand, bike tools, and floor pump. We will have an assortment of repair parts available. From loop 340, take Route 6 South toward Bryan/Marlin. Exit at Hallsburg Road and follow FM3222. Hallsburg Elementary School will be approximately 2 miles down FM3222 on the left. The event will be in the gym.